Due to the growing importance of safeguarding our global environment, efficient crankcase ventilation filtration systems are increasingly critical to diesel engine Original Equipment Manufacturers (OEMs). Future worldwide diesel engine emission regulations will require OEMs to continue to reduce total particulate emissions. Current emission regulations in many countries and market segments cover total engine emissions, which include both tailpipe and crankcase. Since crankcase emissions can contribute up to 25% of total emissions, control of this air pollution source is critical to the protection of the earth's environment. 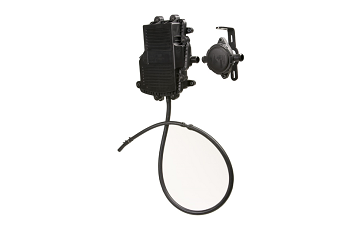 Cummins Filtration's crankcase ventilation systems are innovative products using patented technologies to control oil drip and crankcase emissions in diesel engine applications. The open crankcase ventilation (OCV) systems provide superior aerosol filtering of crankcase emissions, commonly known as blow-by. Blow-by is the result of high pressure gases and oils escaping around piston rings and venting to the atmosphere. This oily mist attracts dust and airborne particles, resulting in an accumulation of contaminants, both on the engine and on the surface beneath it. This condition increases the clean-up required in the engine compartment, as well as unsightly oil drips on highways, bodies of water, parking lots, crops, garage floors and driveways. Cummins Filtration Closed Crankcase Ventilation (CCV) Retrofit Kit protects the engine and provides the best solution for emissions removal - helping to reduce oil consumption by eliminating mist, aerosol vapors and oil drip in the engine compartment. ** Additional hardware (hoses, clamps, oil drain back fittings, etc.) required to complete installation. This Cummins Emission Solution product combination is verified by the Environmental Protection Agency (EPA) to not only reduce emissions but to also provide a cleaner, safer operating environment, for diesel engines model years 1991-2003, regardless of engine manufacturer. Click here to learn more. NOTE: If natural gas, or if fuels containing sulfur or halogen chemicals are used, do not return the oil to the engine.